I’m currently on a long holiday, waiting to begin my next adventure in the new year. And so for the first time in a very long time, I feel absolutely no sense of urgency; I can sit on the front porch and watch the rain drip off the leaves of our Weeping Willow tree if I want to; I don’t absolutely need to make every single second count. It’s liberating, honestly quite exhilarating, but I’m also a bit scared. What if I get used to this? What if I get bored? What if I forget what it’s like to rush and push for deadlines? So I have devised a way to keep my stress levels slightly up: I must try to post a new recipe or blog post up at least twice each week that I’m off. I say that now, but wait ’til I start being able to sleep in again. You lot must think I’m crazy, to be afraid of enjoying my holiday. Oh well, I’m sure the initial shock of it will wear off by the end of week 2. 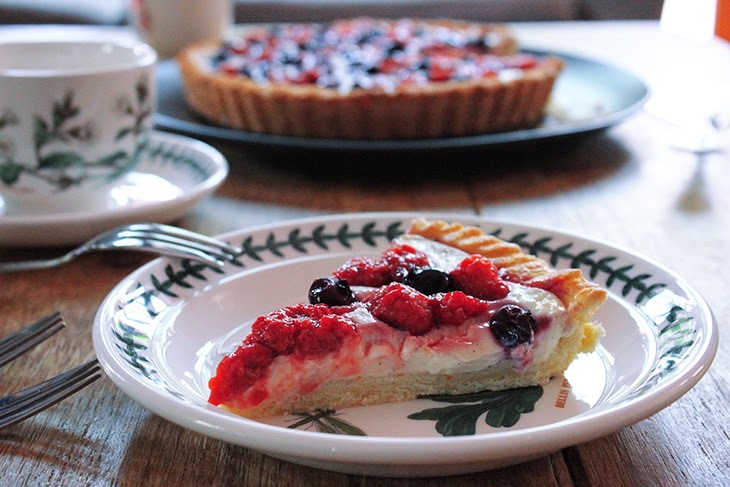 Last week though, I made 3 tarts (blueberry, raspberry, strawberry). Just cos. I experimented with custards, to get slightly runny custard or thicker custards to set, as well as infusing the cream with different flavours (tea, lemongrass, orange). At some point during this holiday, I also want to experiment with different types of yeast (active dry, instant, etc). 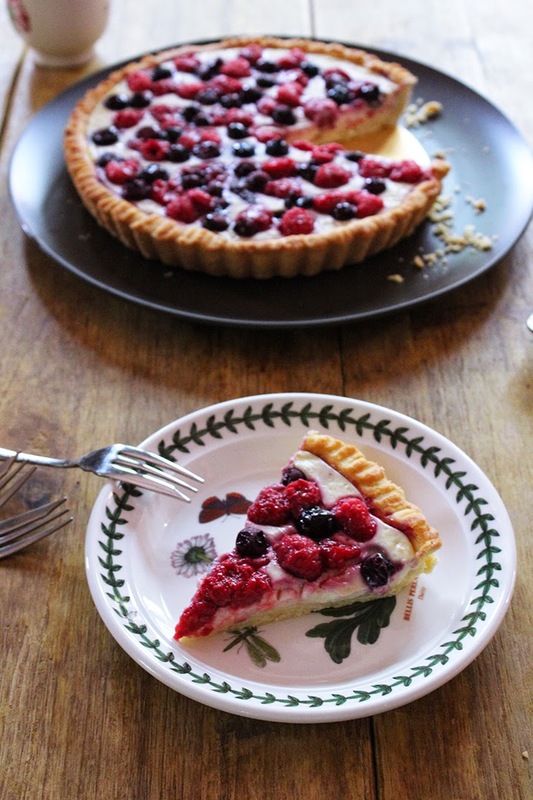 Today I’m sharing my favourite tart from last week, and obviously it was the one with my favourite berry: raspberries! Recipe under the jump. To prepare the berries: Place the washed berries (of your choice, you can use others if you prefer) in a baking tray and toss with sugar and orange juice. Pop it into the oven for up to 10 minutes, just enough to release some juices but not before they get too slumpy. Set aside to cool. To prepare the crust: Combine the flour, icing sugar, and almonds in the food processor and whizz to mix. Pop in the cubed butter and pulse until the mixture resembles coarse crumbs. Add in the egg and vanilla and pulse a few more times until it comes together. Tip the batter onto a well floured surface and knead a few times until it comes together. I like to just then roll the crust out and put it into my prepared tart pan, then freeze for 30 minutes. Freezing the crust means I can skip the pie weights when baking the crust as it holds the shape longer. Bake the crust for 20 minutes then remove to cool. To prepare the custard filling: Heat the milk and cream in a pan until almost boiling, then remove from the heat. Mix the egg yolks with the sugar in a bowl. Whisk in the hot milk mixture, then pass through a sieve into a clean pan. Heat gently, whisking, until thick enough to coat the back of a spoon. Pass through a sieve into a bowl, stir in the orange zest and juice, then pour into the cooled pie crust. Top with the prepared berries and set aside to cool to room temperature. 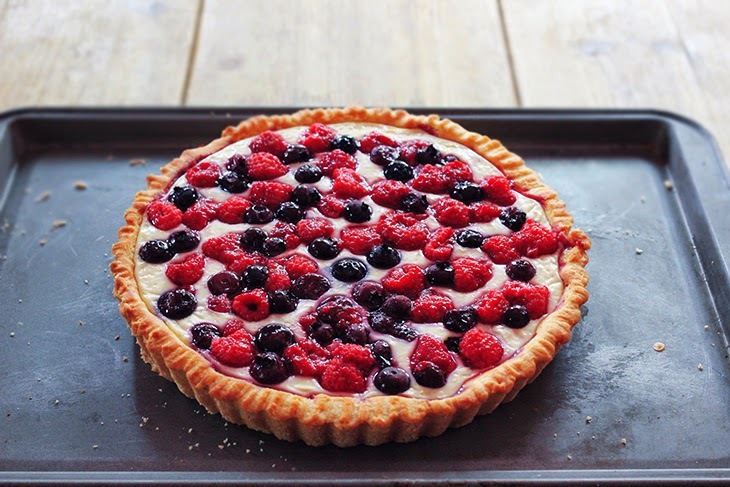 Refrigerate the tart for at least 3 hours, or overnight, to allow the custard to set before serving.